All travel destinations have something wonderful to offer. Many places have a specific thing that they are known for, and that is the reason people visit. Whether it’s the weather, the nightlife or the architecture, there are plenty of amazing places that are known for one thing in particular, and that’s what draws people to them. And then you have somewhere like Thailand. South-East Asia’s most popular destination is something like a collage of extraordinary sights. It’s the sort of place that you could visit over and over again for years and never fully experience everything that it has to offer. Are you looking for a trip that takes you off the beaten track and into some of the less “touristy” parts of the country? Then Pai is absolutely perfect for you! This quiet village located in northern Thailand is fast becoming a sought after destination for backpackers and travellers looking to get a taste of village life. Not only that but it also features some absolutely stunning scenery. Picturesque valleys, impressive mountains and relaxing hot springs are all on offer in this fantastic hidden gem of a destination. Going in completely the opposite direction, Pattaya is one of the most popular destinations in Thailand, and with good reason! Located fairly close to Bangkok, it’s very common for visitors to take a trip down to Pattaya beach for the day to soak up some sun, sea, and sand. The popularity of this location can make it a little crowded at times, but there are plenty of beaches that allow you to find your own space to relax, play and sunbathe. If you’re taking a city break in Bangkok, then you owe it to yourself to take some time to enjoy the beach! 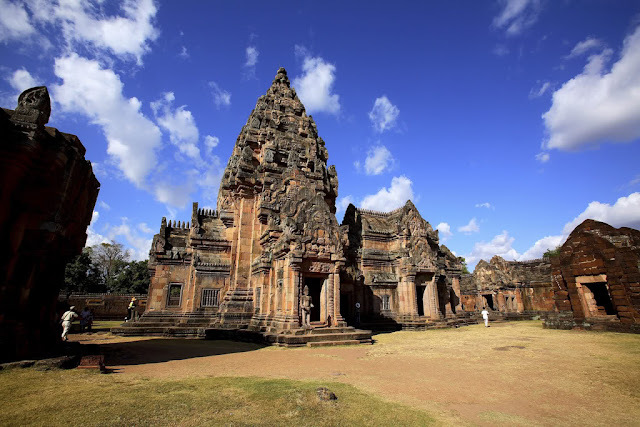 If you’re in the mood for awe-inspiring history and architecture, then you have no excuse not to visit Phanom Rung. This Hindu shrine complex, located in northeastern Thailand, was created to honour the Hindu god Shiva. The architecture is simply stunning and, because it faces east, four times a year the sun shines through all fifteen of its doors. Many people celebrate the Phanom Rung Festival during the alignment that happens in April. If you want to get a taste of Thailand’s rich and long-standing cultural history, then there really is no better destination. If you want to get away from it all and relax then, you can’t go wrong with this gorgeous peninsula. Only accessible by boat, Railay is beloved for it’s quiet, secluded nature, picturesque beaches and cliffs that are absolutely perfect for rock climbing. Unlike much of Thailand, there are no high-rise buildings located in Railay, with much of architecture hidden by lush greenery and beautiful forests. Thailand is a wonderful country with so many places to explore- these are just four great examples that are must-visits for the travellers out there wanting more of an experience and off the beaten track places. What other places would you recommend visiting?